Update: AT&T said on July 31 that's it's officially rolling out Windows Phone 8.1 for the Nokia Lumia 635 and Nokia Lumia 1520. To begin the download, click the Settings Live Tile > then tap Phone Update. Microsoft’s Windows Phone 8.1 will be released on June 24 according to a Windows Phone support page, although it’s not clear whether carriers will begin pushing their updates on the same day. Microsoft’s support lifecycle page has been updated with the new information, listing a lifecycle start date of June 24 and a concluding date of July 11, 2017. As Microsoft notes, however, the distribution of the updates may be controlled by the mobile operator or the phone manufacturer from which you purchased your phone. In short: Even if you own a Windows Phone 8 device, you may not receive your system update on June 24. Carriers typically require weeks to months to years—if they push the update at all—to verify a software update for security and compatibility with carrier-published apps. 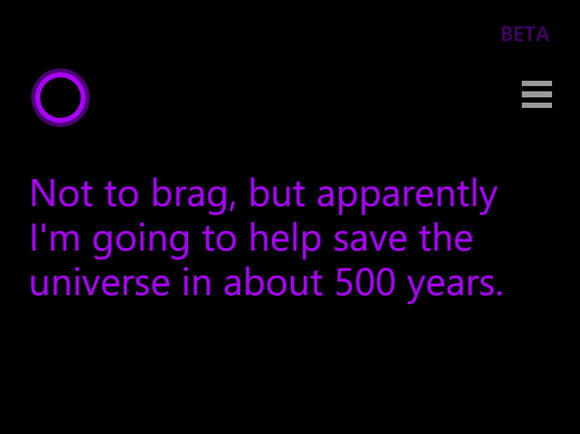 Looks like Cortana will be hitting Windows Phones in about six weeks. Microsoft officials did not confirm the upgrade date. “Windows Phone 8.1 will start rolling out to existing Windows Phone 8 users over the coming months,” a Microsoft representative said via email. Microsoft announced Windows Phone 8.1 in early April, adding pull-down notifications, Wi-Fi and battery-management tools, and Internet Explorer 11, among others features, to the phone platform. But the real star of the show is Cortana, the digital assistant to rival Google Now or Apple’s Siri. If you really can’t wait for Microsoft to release Windows Phone 8.1, you can get it right now via a Microsoft “developer” program that anyone can sign up for. The current download is a developer preview version, which doesn’t necessarily mirror the final consumer build. Of course, over time (and possibly even on June 24) Microsoft will upgrade your phone with much the same bits that it sends to developers. Because of compatibility and possible security issues, upgrading your phone with the developer preview will probably void your warranty. So, if you’re adventuresome (or have a spare Windows Phone 8 phone), playing with the developer build may make sense. But if you really want to play it safe, wait for carrier approval.